The most dangerous verses in the Bible are the ones we know well. They’re the passages we memorize in Sunday school, preach from the pulpit, reference in books, and yet for which reflective meditation is often difficult. 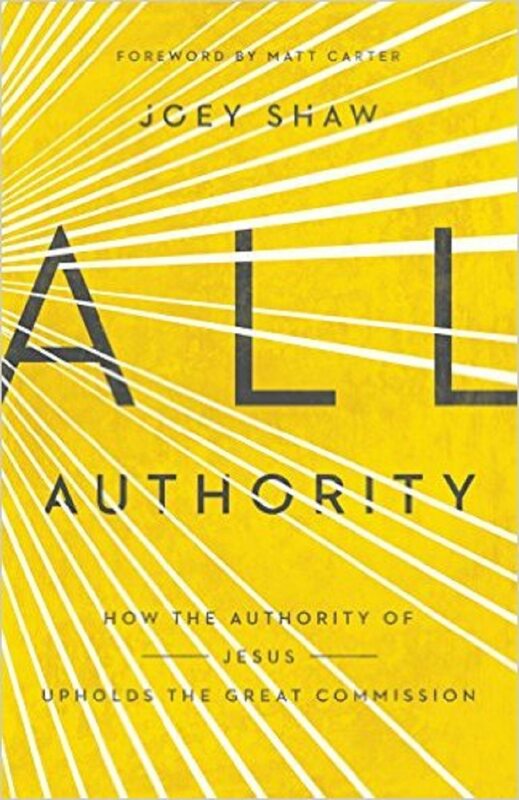 Joey Shaw’s new book, All Authority: How the Authority of Jesus Upholds the Great Commission, offers a needed corrective to cursory readings of one of Scripture’s most familiar texts—the Great Commission (Matt. 28:18–20). In particular, Shaw seeks to sketch the connections between the commission (v. 19) and the promise (v. 20), and to tether them both to Jesus’s authority (v. 18). Shaw is the international field office director at Austin Stone Community Church in Texas, where he oversees 100 missionaries sent out from the church. His book draws on his firsthand experiences growing up in Latin America and living and traveling in the Muslim world. Yet All Authority isn’t another church planting handbook or excursus on a subjective missionary call; it’s a treatise based on the objective bedrock of Jesus’s rights as Lord—his rights to call and commission, to save and secure. The book opens in worshipful reflection on the rights of Jesus seen throughout the New Testament, especially the Gospel accounts of his miracles. Shaw connects Jesus’s exclusive authority with his exclusive position as Savior. As such, the gospel we believe and declare entirely depends on the legitimacy of his authority (25). Shaw also traces the theme of authority in Christ’s offices as prophet, priest, and king. Jesus demonstrated unique authority by his repeated utterance “Truly I say to you”—without invoking the name of the Lord. Unlike mere prophets, Jesus claimed the right to speak for God as God. He was both messenger and ultimate Word, perfect priest and final sacrifice. Regarding his kingship, Shaw reminds Jesus’s reign is both real and yet not fully realized, which explains the sin and suffering we still experience. Last, Shaw demonstrates that the “Acts of the Apostles” is, more accurately, the “Acts of Jesus through the apostles in the Spirit’s power.” Luke repeatedly records that the Lord opened blind eyes and added to the believers’ number. The narrative structure of Acts mirrors the Great Commission, with Jesus’s reign in heaven fueling gospel progress. In other words, Acts puts flesh on the Great Commission, showing that missionary advance and church growth is only possible through the exaltation and authority of Jesus. “Truth is the bedrock of mission,” Shaw observes at the outset (3). And not just any truth, but the certainty of Jesus’s all-encompassing authority. Mission fundamentally begins and ends with a clear vision of Jesus as Lord and—contrary to some missionary manuals—not necessarily with personal calling or passion for the lost. What we know and believe about Jesus shapes what we do for Jesus (5). “The more people cherish the doctrine of Christ’s authority,” Shaw asserts, “the more they’re willing to risk and endure” (11). This plays out in the early stages of missionary candidates moving overseas to take the gospel into danger’s path. It continues when they face inevitable suffering. After all, nothing is more comforting amid danger and tragedy than knowing King Jesus is on his throne (72). Shaw supplies examples from experience, his missionary parents, and various colleagues in different ministry stages who faced incredible obstacles. The two primary questions when we suffer, he contends, are these: (1) Who is in control? and (2) Where is God? The Great Commission answers our greatest questions, as Jesus both claims authority and promises his presence (79). But such authority isn’t merely our foundation or motivation, it’s our message: “Jesus is Lord” (191). The Lordship of Christ is the defining declaration of the Christian message. Whenever we make disciples we’re calling them to pledge allegiance to Christ as King, submitting in obedience to all he’s commanded. A final theme is the need for constant abiding in Christ. While Jesus possesses all authority, and while he launches us as ambassadors of his kingdom, we access power for ministry only as we behold his glory, draw on his strength, and obey his commands. The inherent nature of spiritual warfare—especially apparent in certain missionary contexts—demands extended prayer and fasting. Shaw calls for a corrective to many of our endeavors: we must balance the need for Great Commission obedience with the need for Holy Spirit power (153). How we answer such questions has significant implications for ministry and Christian life. Rather than flattening the reality of Jesus’s authority, Shaw explains why the sonship of Christ, and his subordination to the Father, doesn’t imply inferiority but rather relational unity. I think at times, though, Shaw overstates his argument (saying that without divine sonship there’s no divine unity) and falls short of providing a cohesive defense of his assertion that the Son’s authority was given in eternity past. Nevertheless, this chapter is a helpful addition to the discussion, particularly important in the context of ministry to Muslims. All Authority is biblical and encouraging. Shaw’s personal writing style, including his poetry throughout, lends a devotional quality. His tone is pastoral, yet his understanding and experiences are global. While his examples are predominantly from Muslim contexts, he provides a wide variety of anecdotes on everything from personal hardship to demonic attack. He also demonstrates a willingness to address difficult doctrines, since he believes biblical truth is finally what motivates mission. I would’ve preferred Shaw address Jesus’s authority in a more biblical-theological way, tracing the theme through the Gospels. He could’ve drawn on Matthew’s own development of the theme, from Jesus’s authority to command (“go”) in Matthew 9 to a comprehensive treatment of Jesus’s authority to delegate (“keys of the kingdom”) in Matthew 16. In the end, though, All Authority succeeds in its mission—glorifying Jesus as Lord and calling us to go in his power to the nations. This isn’t just a book to stir up the next generation of laborers to go to the hard places. It’s a needed encouragement and guide for all those sowing and suffering even today.